The scalable Pennsylvania map on this page shows the state's major roads and highways as well as its counties and cities, including Harrisburg, the capital city, and Philadelphia, the most populous city. To display the map in full-screen mode, click or touch the full screen button. To zoom in on the Pennsylvania state road map, click or touch the plus (+) button; to zoom out, click or touch the minus (-) button. To scroll or pan the zoomed-in map, either (1) use the scroll bars or (2) simply swipe or drag the map in any direction. (The scrolling or panning method you use will depend on your device and browser capabilities.) At any time, you can display the entire Pennsylvania road map in a new window or print this page, including the visible portion of the map. Pennsylvania's Interstate Highways connect its major cities and facilitate travel between the Commonwealth of Pennsylvania and its neighbors. I-76 and I-80 cross the state from east to west, I-79 traverses western Pennsylvania from north to south, and I-81 runs southwest from northeastern Pennsylvania. I-84 crosses the Poconos between Scranton and the New York border. An auxiliary Interstate, I-476, runs from Scranton area southward, traversing Philadelphia's western suburbs and connecting with I-95 near Chester. Pennsylvania's auxiliary Interstate Highways serve, and connect, some of the state's major metro areas. I-176 links the Reading area with I-76. I-180 connects I-80 with downtown Williamsport. I-276 traverses the northern suburbs of Philadelphia, connecting with I-76 near Valley Forge and extending to the New Jersey border at the Delaware River. I-283 connects I-83 and I-76, east of Harrisburg. I-279 provides access to downtown Pittsburgh from I-79, while I-376 connects downtown Pittsburgh with I-76 to the east. I-380 runs through the Pocono region, connecting I-80 with I-84 near Scranton. I-476, the Pennsylvania Turnpike Northeast Extension, links I-81 near Scranton with the Allentown and Philadelphia metro areas. I-579 is a short highway that links I-279 and I-376 in Pittsburgh. I-676 serves downtown Philadelphia, connecting I-76 at its western end with I-95 and the Ben Franklin bridge to New Jersey at its eastern end. A trip through the rolling farmland of Pennsylvania Dutch country gives travelers an up-close snapshot of Amish life. The town of Lancaster features a Central Market offering local specialties such as produce, quilts, and furniture, as well as a 90-minute walking tour of the city led by a costumed guide. The town of Strasburg is home to the Railroad Museum of Pennsylvania and visitors can take a 9-mile round-trip on the Strasburg Railroad. Pennsylvania Route 252 provides access to the historic Valley Forge encampment site, while U.S. Route 15 provides access to Gettysburg, where an important Civil War battle was fought. 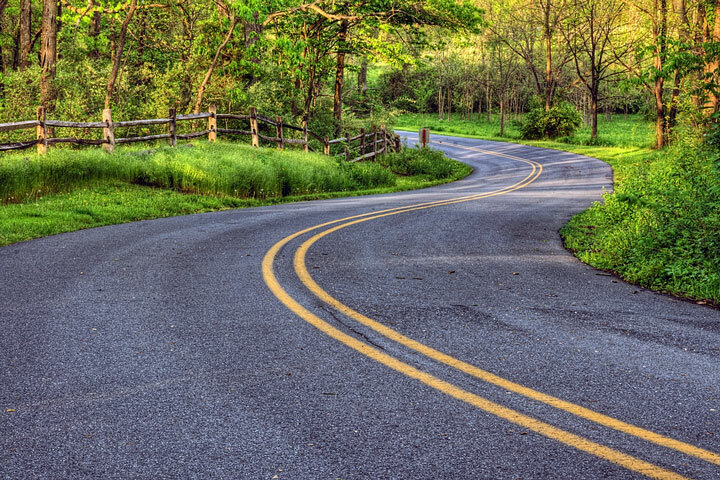 More information about scenic roads in Pennsylvania is available on this Pennsylvania Scenic Byways page. For more information about Pennsylvania's roads and transportation infrastructure, visit the Pennsylvania Department of Transportation website. For Pennsylvania road traffic conditions, visit the Federal Highway Administration's Pennsylvania Traffic Information page.